An oil rig berthed in the Palumbo boatyard in Grand Harbour is an "eyesore" and needs to be removed ahead of the celebrations next year marking Valletta being recognised as Europe's cultural capital, V18 Chairman Jason Micallef said today. "How can we promote the Grand Harbour as a destination for tourism or as a valuable European, national landscape when we have the oil rig ruining the view?" he asked. 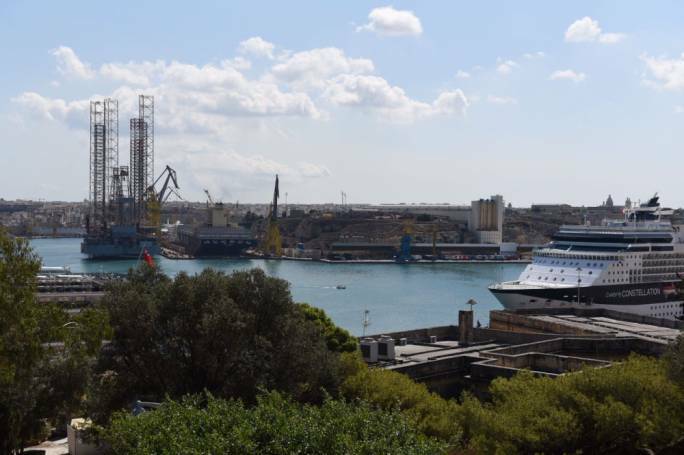 Micallef, who was addressing the media in Valletta across the Palumbo yard, also noted that the oil rig had been parked in Grand Harbour for a year, for seemingly unknown reasons. Construction work in Valletta will also be kept to a minimum next year, and Micallef revealed that both private and public works would be limited throughout 2018. Flanked by local council mayors from Paola, Cottonera and Kalkara, Micallef said they would be sending a letter to the Lands director urging him to launch an investigation into the matter. When asked about the long-awaited new waste management plan for Valletta, Micallef revealed that an agency dedicated to the collection of commercial waste would be launched in the coming days. "We need to stop adopting a laissez-faire attitude when it comes to the environment," he insisted. The Palumbo Malta Shipyard insists that the oil rig has the authority's clearance to remain in the Grand Harbour. The company went on to say that "it had beat off tough competition from international yards to bring the oil rig’s business to Malta," eventually securing a two-year contract with the aim of revamping the oil rig. “The oil rig’s presence in the harbour is a commitment we have undertaken, which also has positive ripple effects for its ship agents and ship suppliers,” the company said in its statement, adding that the shipyards' activity is in line with the government's vision to boost maritime economic activity.